With so many different types of wood flooring finishes to choose from, it is equally important to choose the right finish application for your home; Equally important to choose the right flooring company for the job. The right flooring contractor will not only help you select the proper finish, but will have vast experience in each floor finish to ensure its correct application. With over 20 years of experience, I have used all the different types of finishes available. This means that only will I know how to apply the finishes correctly, but will also ensure that we will know how to correct any of the many adverse effects that can go wrong. Working with an inexperienced flooring contractor can surely yield negative results often costing you more money, loss of time and an overall unpleasant experience. This is often caused by using improper cleaning products on the finishes that do not thoroughly clean the floor and remove grit; also by using large amounts of water or strong solvent based cleaners. Heavy traffic and nails from dogs, and furniture legs that are not protected by felt and lastly and most importantly, cheap finishes or insufficient number of coatings for the traffic levels of the home. Cure: use only cleaners made specifically for wood flooring, apply felt pads to bottoms of chair and table legs, strategic area carpet and mats and keeping your dog’s nails trimmed. These are all preventative. Finishes compromised this way can be recoated and restored provided you do not wait too long to address them. Oil based polyurethanes will amber and will yellow over time when exposed to direct sunlight. Water base finishes can tend to “bleach out” when exposed to similar lighting but will prevent yellowing over time. Wood also oxidizes over time in its natural aging process. Cure: Proper shading of the flooring exposed to these situations will minimize these effects. Depending upon the depth of the staining and its source, stains are often caused by pets, water, shampooing carpets and using improper cleaners. 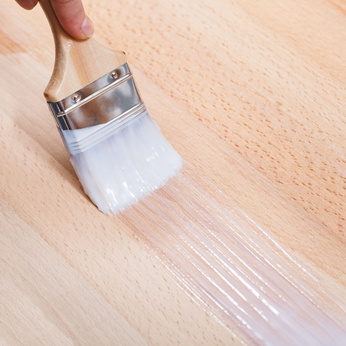 Determining if the wood itself or finish is stained or damaged is important to consider the required fix. Cure: pet stains will often require deep sanding and possible board replacements. Bleaching DOES NOT work, water damage can be sanded and repaired where necessary. Finishes that are damaged can be abraded and touched up to full recoating of the entire area for best results. This occurs when during application, the finish actually pulls away from itself causing separation in the wet application that actually resembles an alligator’s skin. It is caused when finishes are applied under very cold temperatures, applying top coatings before the previous cost is sufficiently dry, applying too heavy, contamination such as chemical cleaners, or using thinners that cause the finish to dry too quickly. Cure: a full screen and recoat when finish is dried properly and sometimes a full resand is in order. Is typically caused by insufficient preparation of the floor prior to an application of finish such as poor vacuuming and no tack ragging. It is also caused by contaminations of the finishes. Improper abrasion of prior coatings in water base or oil based finishes can cause rough results. If water base finishes are used, they tend to raise the grain of the wood flooring and it is necessary properly san in between coats to compensate for this. Screen and/or abrade finishes properly to a smooth gloss free sheen. Clean the floor properly by vacuuming thoroughly as well as tacking the floor with a clean cloth and water to remove dust. If improper sanding techniques were used, it will require a full resanding to correct. This is caused by insufficient mixing of finishes with flattening agents in them such as Satins and Semi Glosses. A contaminated applicator, uneven application, uneven sanding can also be the culprits. Cure: Screen thoroughly, clean and reapply new finishes evenly. Make sure finishes that requires mixing are stirred properly. If bad and uneven sanding is the problem, a full resand may be in order. Insufficiently cleaned, finish being overworked during application or some fomr of contamination on the floor prior to the coat application. Direct sunlight can cause “Hot SPOTS’ in the floor causing it to set too quick before bubbles can level off normally. Peeling is a result of contamination, improper abrasion of coats or lastly, the prior coating was not dry enough before the next was applied. Conditions will need to be sanded and started over as more than likely it will lead to peeling. A peeling finish CAN NOT be recoated, but must be sanded down and started over. Often caused by rolling a finish with a roller that is not properly napped for it or the finish doesn’t allow for it. It gives the appearance of the skin of an orange. Cold temperatures can also cause this. Cure: simply screen and recoat, use proper applicator and make sure temperature is at a comfortable setting. Also known as Craters, crawling, holes, spots or flow marks is most often caused by a contaminated finish, applicator, and or floor. Driers or solvents in an area. Cure: screen and recoat. If easily scratched off or peels, full resand the floor. Not the menace to society running through the street naked, but the appearance of high and low gloss levels, brush marks or applicator marks in the finish after it has dried. Caused often in water base, other finishes can result this way as well. Finishes applied with too much air movement, not keeping a wet edge, uneven mixing of the finish, and proper spread rates can cause this. Cure: screen and recoat. If severe enough, a full resand could result. They are often mistaken for bubbles, but look like moon craters. Contamination, as you can see is said often enough. Cleaners, waxes, silicones chemical etc are the culprit. Cure: scrape lightly, sand to blend and touch up or fully recoat. Severe enough conditions can cause peeling and full resand will be required. So as you can see, with all the things that can go wrong in finishing, it is important to select and work with an experienced flooring crew that can avoid and if necessary, correct these issues properly.